What are you offering to HIm? We are with Jesus in the treasury as He watches people depositing their offerings in the treasury. When we looked at this story in Mark we learned a LOT about the setting and the offering ritual. That blog was “A Penny From The Heart.” I had a ton of questions I have always wanted to ask. We also looked at the heart as the gift. I have a confession to make; I’m having trouble with where to go today. Or I was until I sat still for a moment. I was prompted to look at the gift given in terms of time instead of money. To use the principal Jesus applied to her giving financially to us giving of our time. We often hear the phrase, “time is money.” It is appropriate for today’s discussion. Please don’t throw “rotten tomatoes” if my analogies fall short tonight. I’m simply going to let this thought take us where it will and trust that God is still in control of our direction. So many of us are busy beyond belief today. A few months ago my own business quotient went up too. But in all our business, how are we using our time? 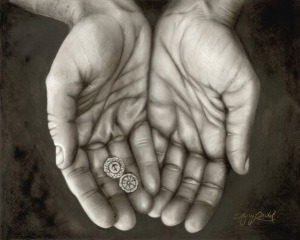 How much of it are we giving to God? Paul said to “pray without ceasing” in his first letter to the Thessalonians. That would mean that you were at least paying some attention to God, or the needs of others, at all times. I know I fall short of this quite often. I do spend a large portion of my day with God at least present in my mind, but I also find myself dwelling on UN Heavenly ideas too. I try and set aside time to write every night. I want very much to give it completely to God, but I find my attention drifting or waiting until the “last minute” to start my bible time. Sometimes I even push back the time because I have other things I want to do instead. On those days I’m only giving God my “extra” time. I’m not giving Him all my time. I don’t mean to say that I want to sit and read His word or focus solely on God all day every day, but that I want Him and His attributes to be so ingrained in my life that while I’m out doing my daily tasks, that my actions are always reflecting His character. I want Jesus to shine through me in all I do. NO. I’m nowhere near that aspiration, but that is what I feel He wants from me. This would be comparable to what the widow gave. She gave all she had to live on. I want to give all of my life. I don’t want to only think about God when the clock says it’s time to write or when the radio is playing Christian songs. I want to think about Him when I’m frustrated by how long someone is taking to complete a task I could have done faster. I want to hear His words in my spirit when I get angry because I got interrupted again. I want to feel His hand on my shoulder when I push other drivers out of my way. EVERY time I hear, think about or feel His presence I pray I look at my actions and turn my behavior around. Turn back to doing the things that are pleasing to Him. Put Him back in the number one spot in my life. Live every moment of my life as a child of the King. Father God, I am FAR from this goal You placed in my heart today. I know that some days are better than others for me in regards to “praying without ceasing.” You also know the days that are TERRIBLE in this department. Please forgive me Father. Help me live a life pleasing unto You. Help me not simply live a life of a “look alike” child but continually develop our relationship by spending quality AND quantity time with You. Thank You Jesus for Your lessons today. I pray You are able to use or transform what You shared with me today to help someone else You are dealing with on this issue. Thank You for pressing me to continue in Your word tonight. I look forward to what You have for me next.